The watchword of Comic Con this year, as you may have heard, is 3D-- yesterday's panels were a spectacle of the third dimension, and it spilled over into today too, as Disney presented some 3D bits from its upcoming animated slate. In terms of scoops, the presentation wasn't too groundbreaking-- the footage screened was from Beauty and the Beast, which has been remastered in 3D, and Toy Story 2, which will screen as part of a 3D double feature alongside Toy Story in October. There was a brief teaser for Toy Story 3, and it was great, but not part of the actual film. And yet, when it's Disney classics up there on the giant Hall H screen, you can't exactly be disappointed that you're not seeing anything new. Pixar and Disney Animation head honcho John Lasseter, he of the famously loud shirts and boundless enthusiasm, presented all the clips with the creators of the given films-- Toy Story 3 director Lee Unkrich, Beauty and the Beast director Kirk Wise, and Princess and the Frog co-directors Ron Clements and John Musker. Toy Story 3 is obviously the biggest story, even though we didn't learn all that much about it-- Unkrich talked about their decision to set the film when Andy goes to college, and Buzz, Woody and company must cope with the fact that their owner has left them behind. It sounds unbearably depressing for a children's movie, but then again, so does a planet abandoned and covered in trash. The segment they did screen for the film was a hilarious faux-documentary called "Groovin' with Ken," introducing the molded plastic beefcake who will be voiced by Michael Keaton in the film. Wearing awful 80s clothes and contorting his plastic body around his Dream House, Ken is just as silly and deluded as you'd expect, ignoring questions about Barbie's name being bigger than his on the box, and cutting off the interview when he thinks his masculinity has been threatened. Seeing Ken was a reminder of how much more humor there is to milk out of the toy world, especially when done with Pixar's wry touch. As for Beauty and the Beast, it looked gorgeous-- but that wasn't really a challenge, given how beautiful the film was to begin with. 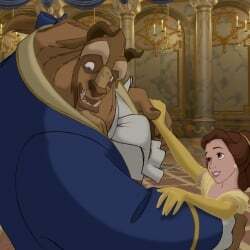 They showed the opening number, "Belle," and I'm pretty sure I wasn't the only one happily flashing back to my 8-year-old self seeing it in theaters. The bit of Toy Story 2 remastered for 3D looked great as well, especially since it was the opening scene of Buzz Lightyear escaping alien hordes on a faraway planet. Most of Toy Story 2 doesn't boast that kind of action, but it's nice to know that, for what little bit they have, it'll look fab. Lasseter introduced a small clip from the upcoming TV Christmas special Prep and Landing, about elves preparing houses on Christmas eve for Santa's arrival. Then came the big Disney finale-- footage from The Princess and the Frog, including an entire musical number performed by the main villain, Dr. Facilier, voiced by Keith David. I've seen various bits of the film previously, at New York Toy Fair and ShoWest, but nothing as fleshed-out and complete as the number, called "Friends on the Other SIde." David's deep voice is a perfect fit for the dark Dr. Facilier, and the song-- kind of like "Poor Unfortunate Souls" crossed with "Never Had A Friend Like Me"-- fits snugly inside the Disney musical canon. 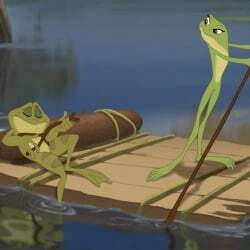 The other Princess scene takes place later in the film, when Tiana (Anika Noni Rose) and Prince Naveen (Brazilian actor Bruno Campos) have been turned into frogs, and are traveling through the swamp to figure a way out of this mess. They're accompanied by a buffoonish sidekick alligator, and are also met by a Cajun firefly named Ray, whose crooked teeth and crazy accent have raised a few eyebrows in the trailers. In long-form, I have to admit, Ray is pretty irritating; Disney has a way of taking wacky side characters and accidentally making them a little too over the top (Lion King hyenas are just one example). I've got my fingers crossed for limited screentime for Ray, since the rest of what they had to show felt so genuine and special. After all the homegrown Disney stuff there was the introduction of Japanese animation giant Hayao Miyazaki, which I've already written about here. The Ponyo clip they showed was truly incredible, and made a pretty nice capper to the presentation, which had been an excellent mix of classical hand-drawn stuff and the cutting-edge 3D. Want more from Comic Con? This is just the tip of the lightsaber. Get it all right here.